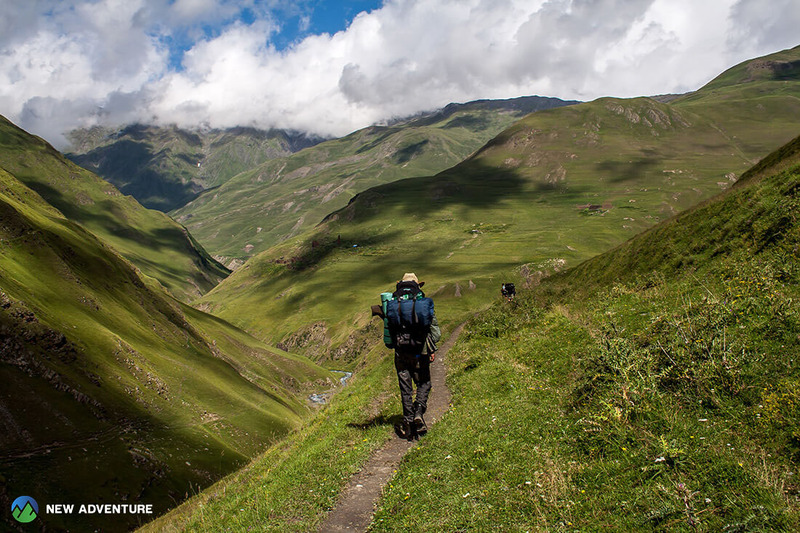 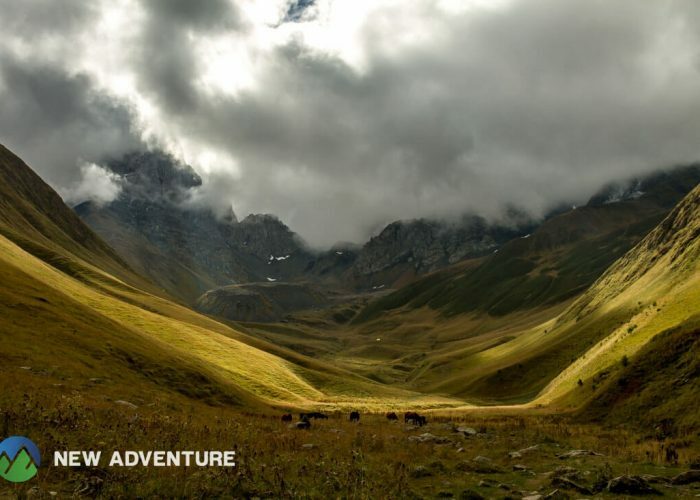 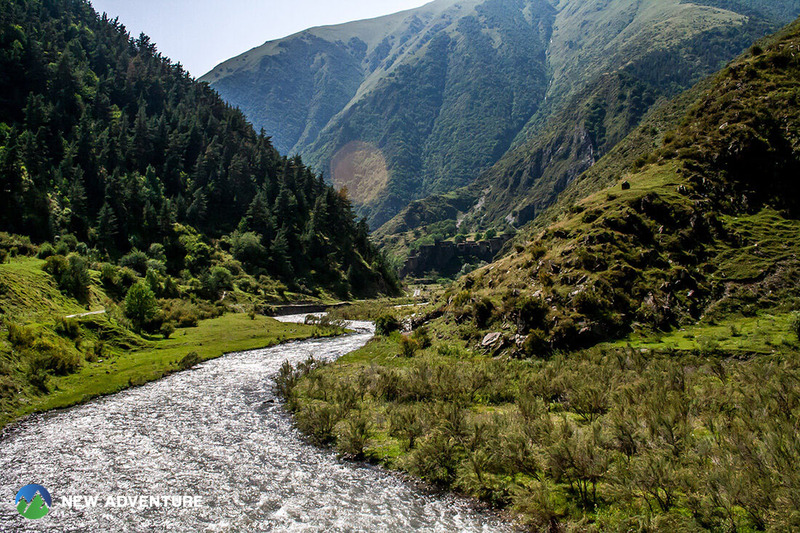 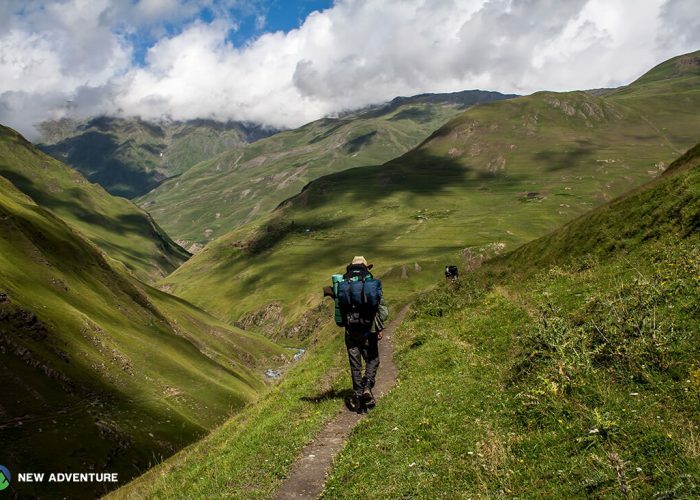 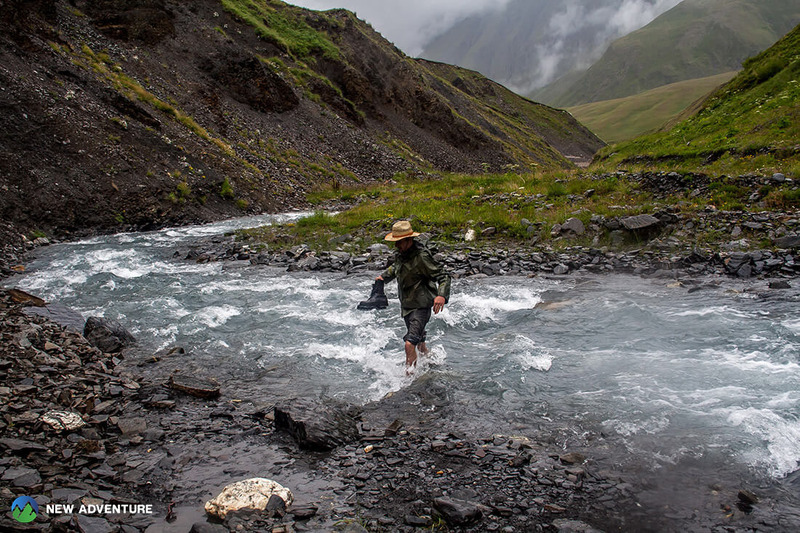 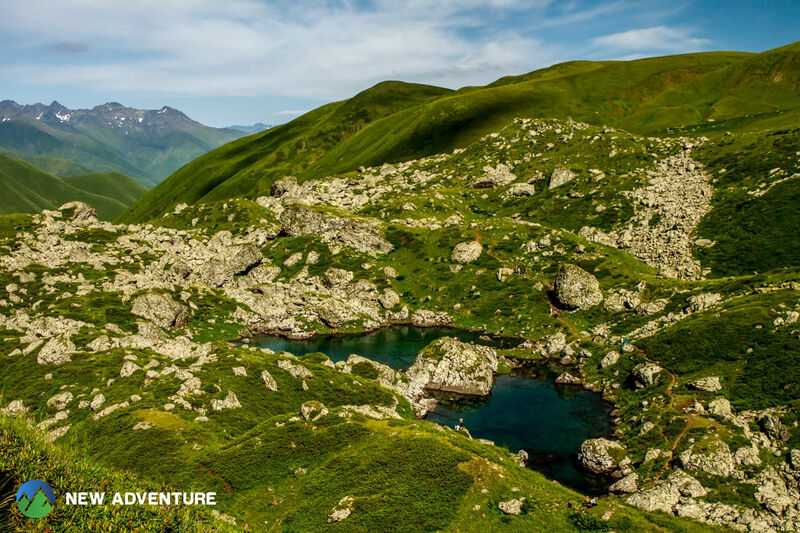 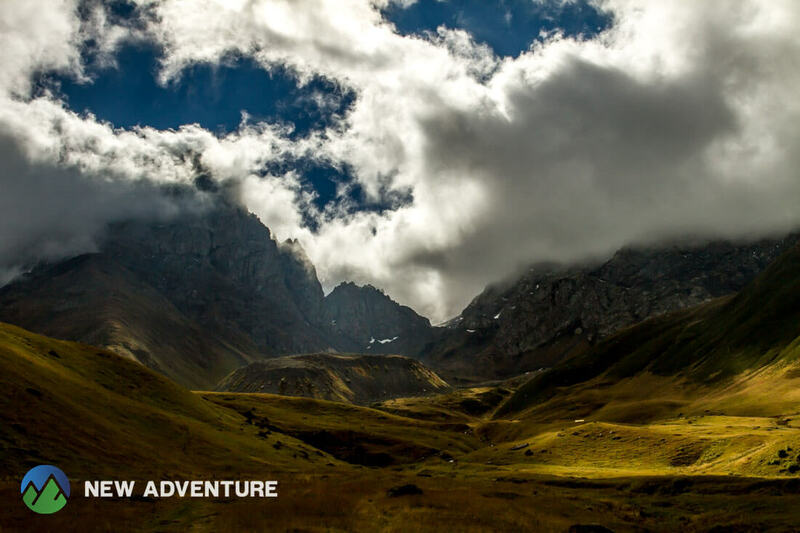 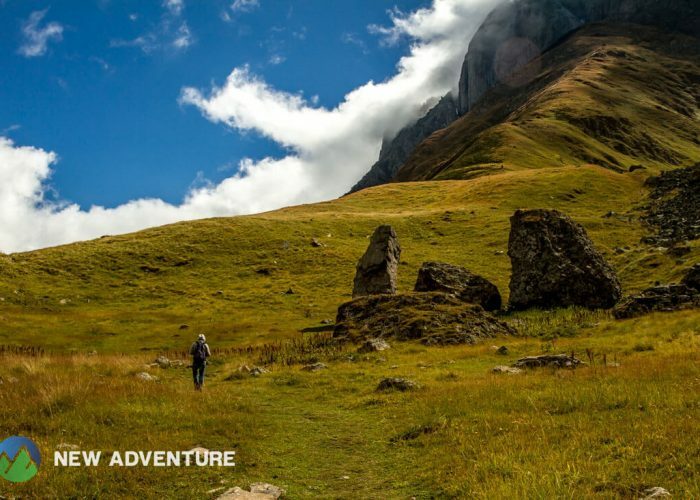 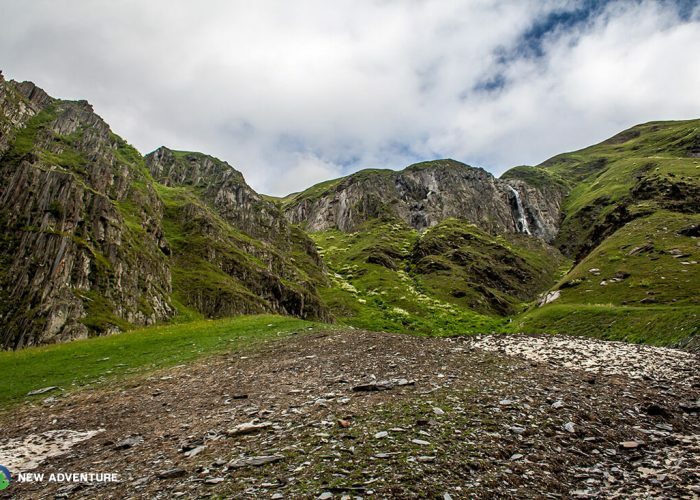 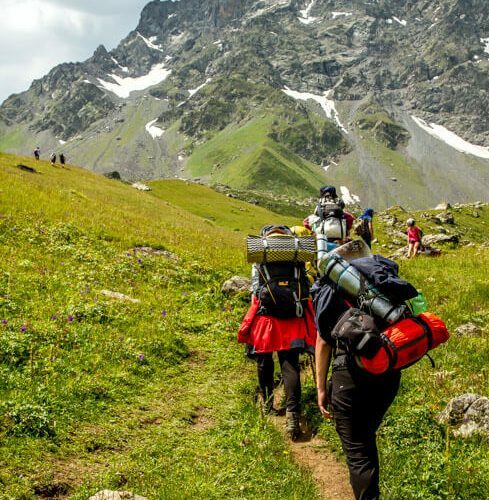 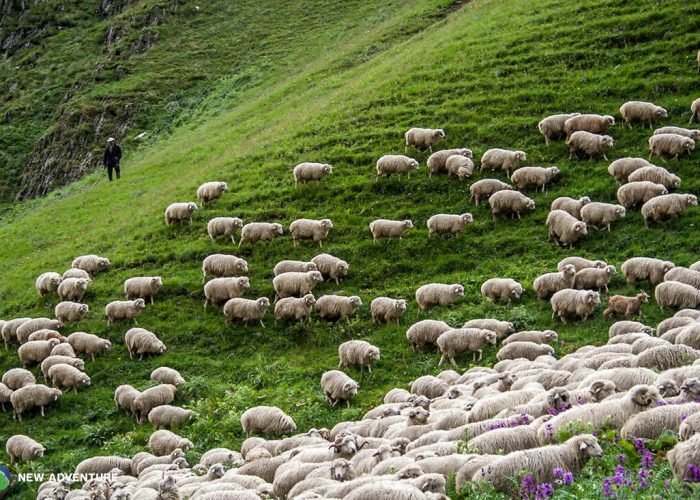 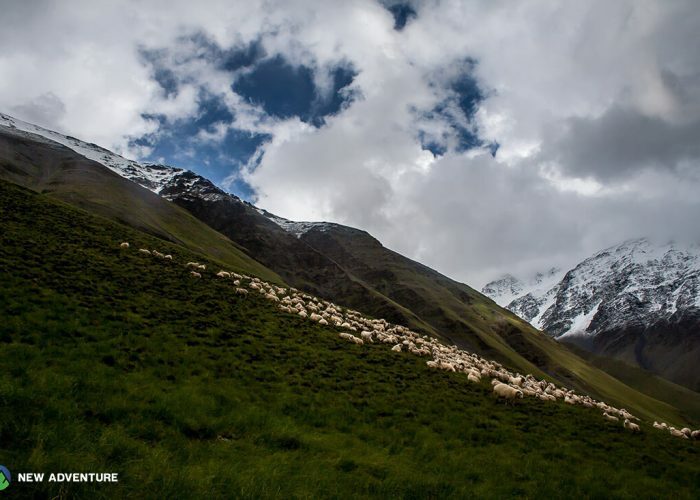 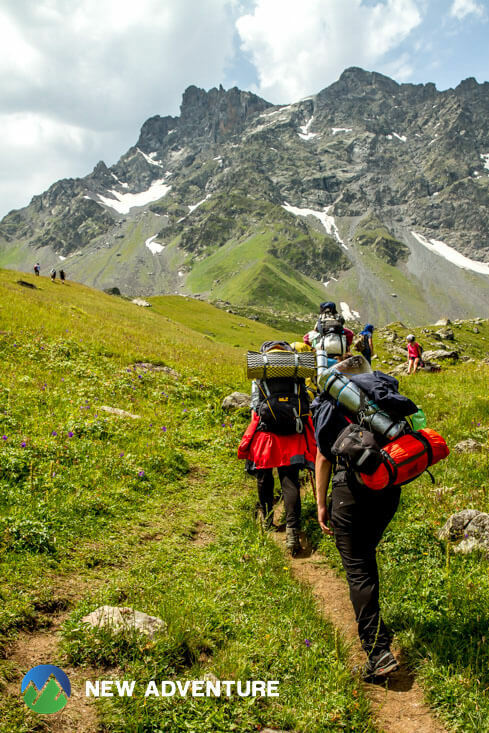 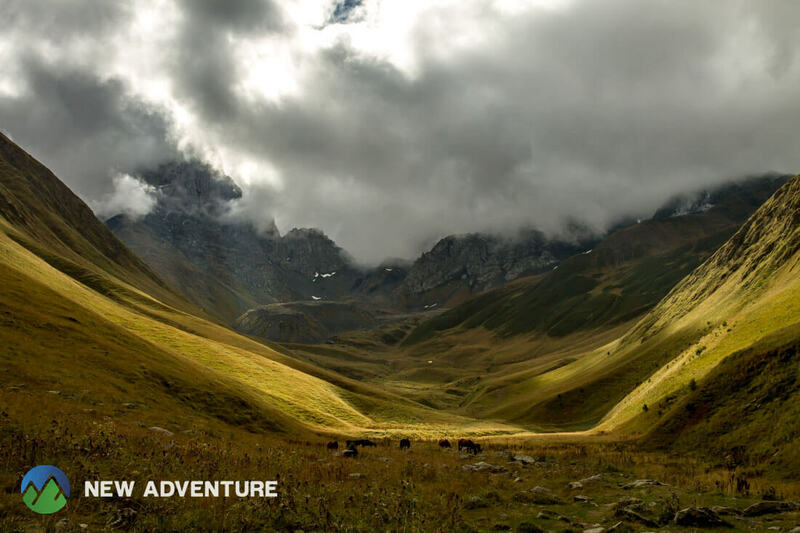 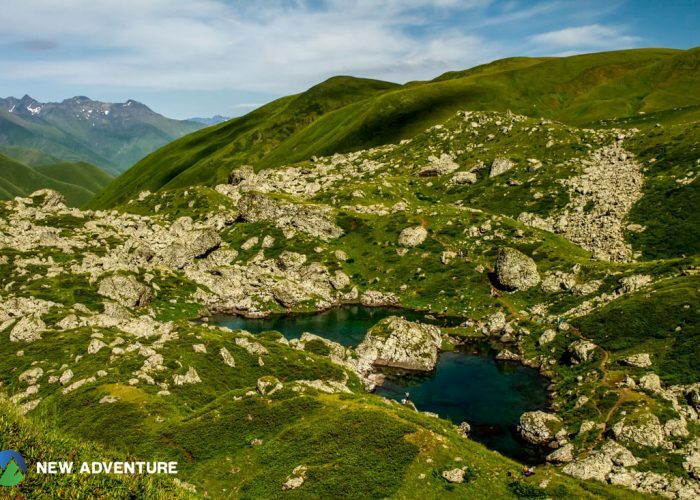 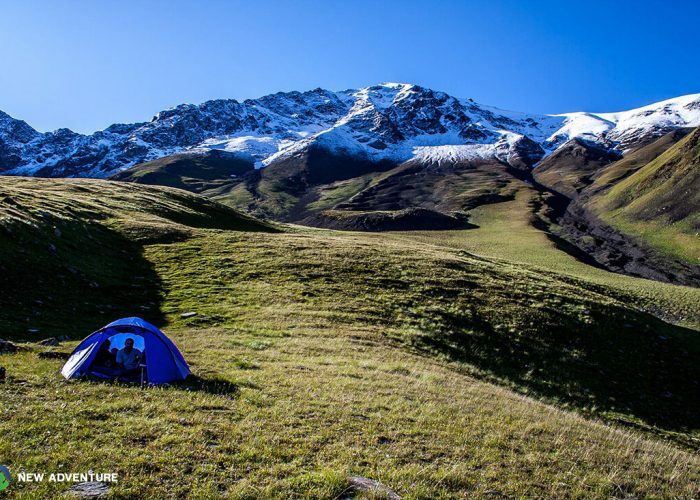 During the tour, we travel in Tusheti, Khevsureti and Khevi – one of the unique provinces of Caucasus Mountains located in eastern part of Georgia. 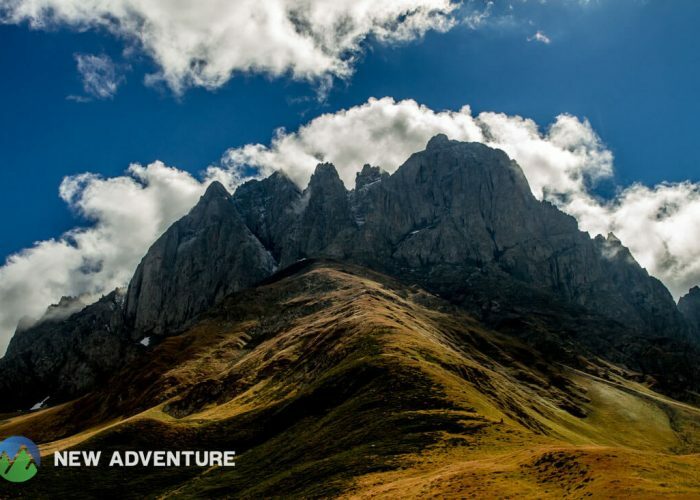 We cross an extreme and beautiful Datvijvari and Abano Passes with off-road vehicles. 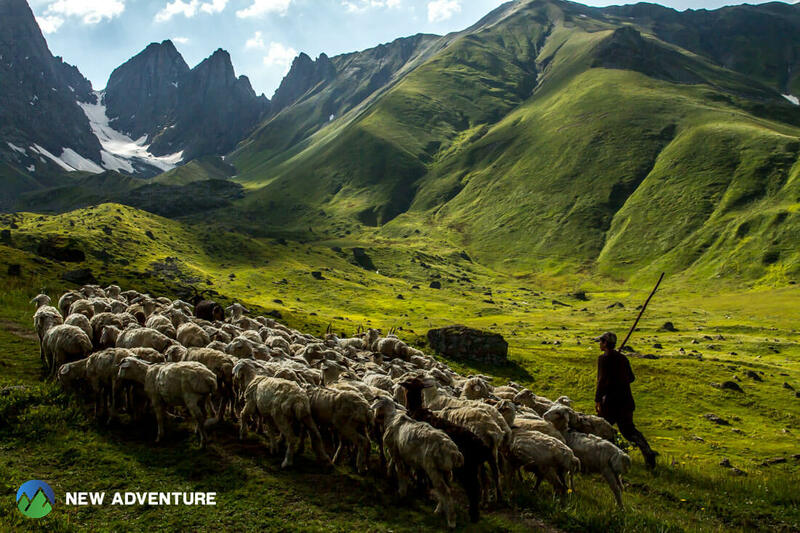 We have an opportunity to get to know highlander traditions and culture, discover ancient villages and fortresses located on steep slopes of high mountains. 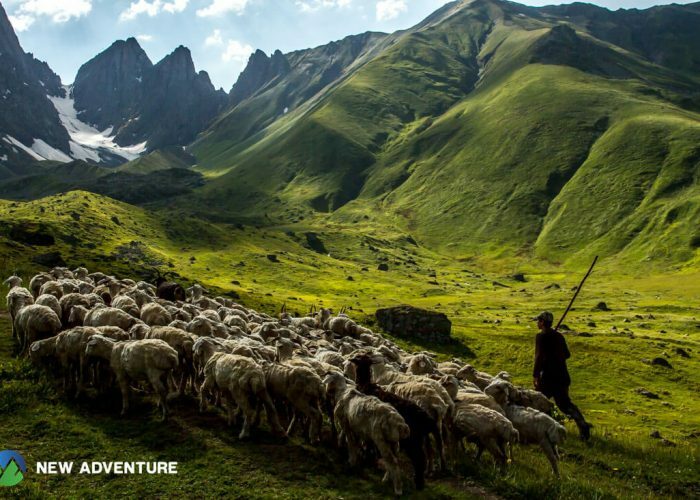 Of course, we taste delicious dishes of Georgian cuisine, prepared according to the local traditional method and enjoy Georgian hospitality. 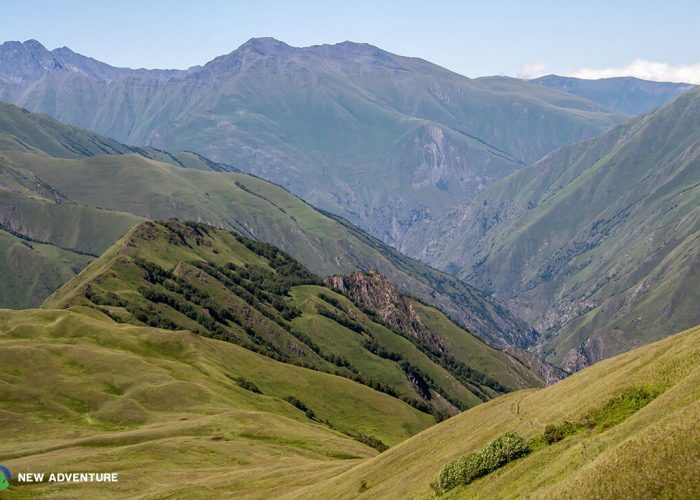 The first day of the tour takes place in capital of Georgia – Tbilisi. 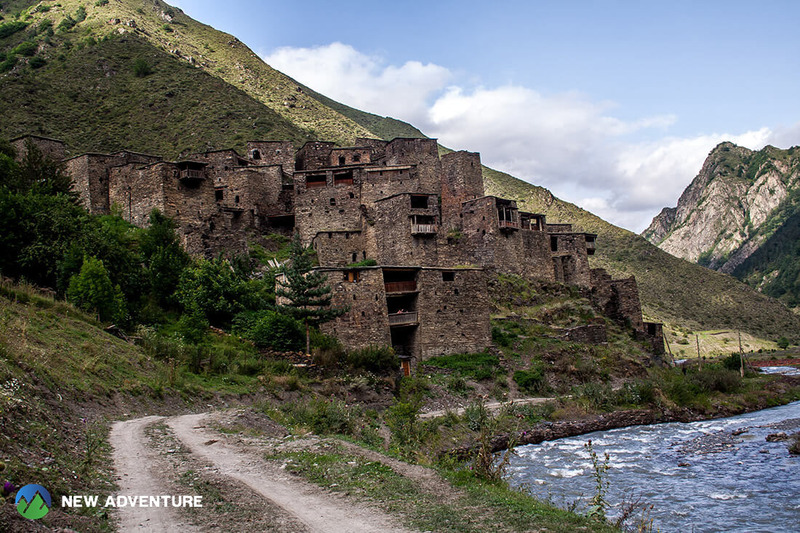 After wandering through the narrow streets and districts of the old town, we visit Abanotubani, famous with sulfur bathes. 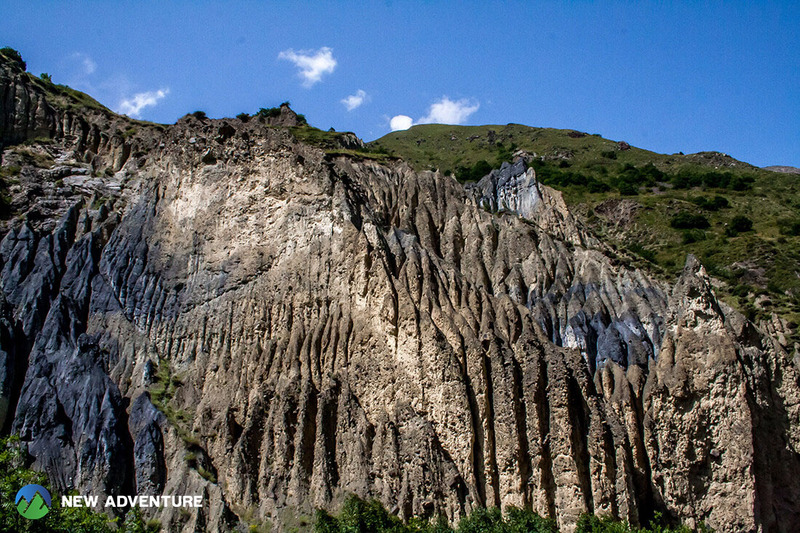 The place is related to the foundation of Tbilisi, as according to the legend, king Vakhtang Gorgasali discovered this place in the 5th century and decided to build a city on this location. 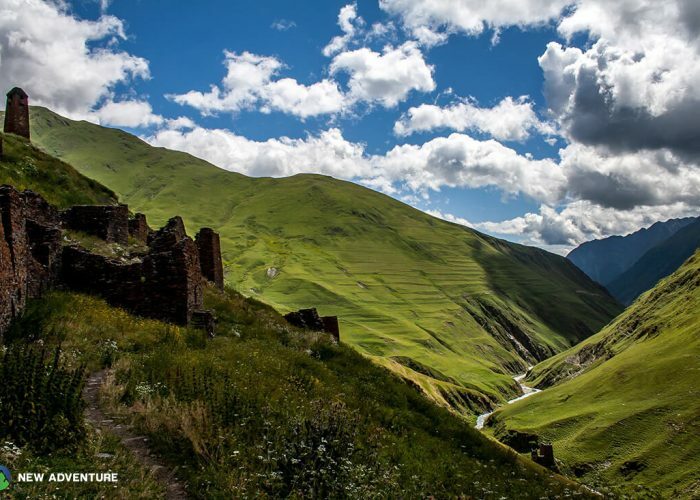 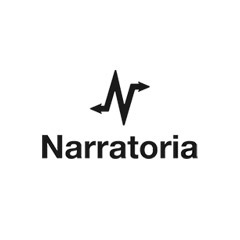 During the tour, we also visit ancient Narikala Fortress, Anchiskhati Church of the 6th century, Monument of Kartlis Deda (Mother of Georgia) and other sightseeing. 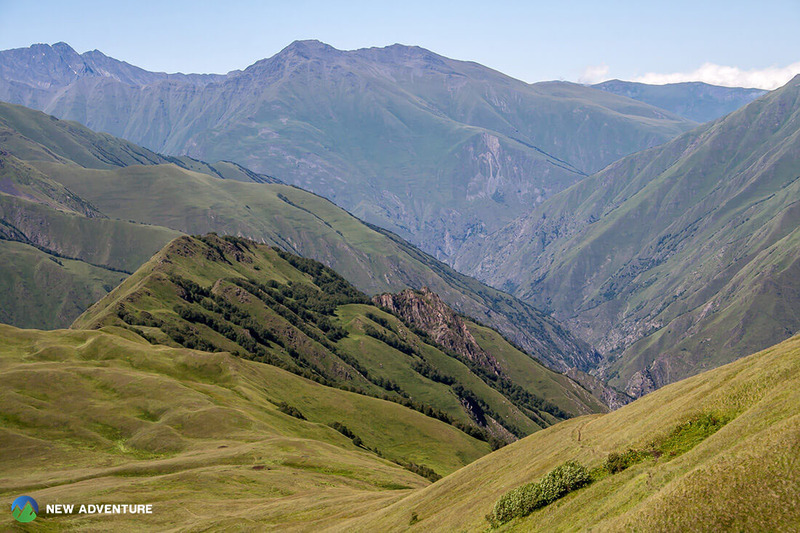 Today we start hiking from the village Girevi towards Kvakhidi early in the morning. 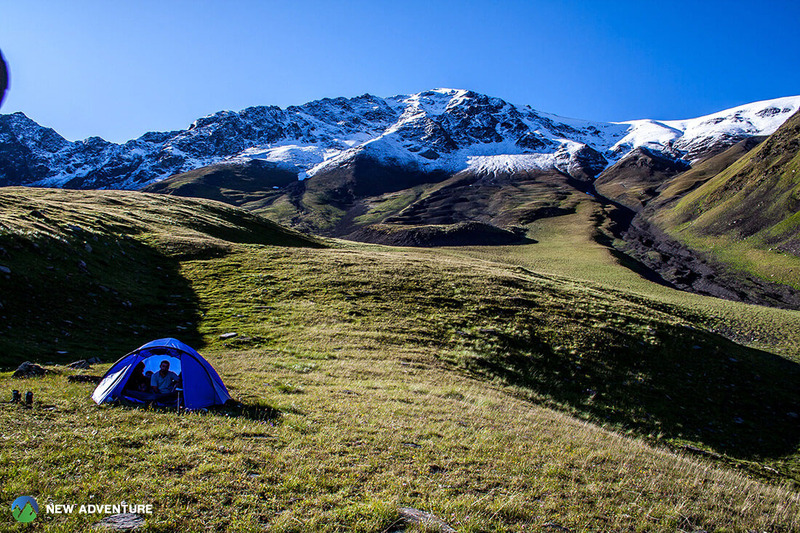 After passing a beautiful gorge and visiting abandoned village Chontio, we set up a camp to overnight in Kvakhidi. We start hiking from Kvakhidi towards Atsunta pass early in the morning. 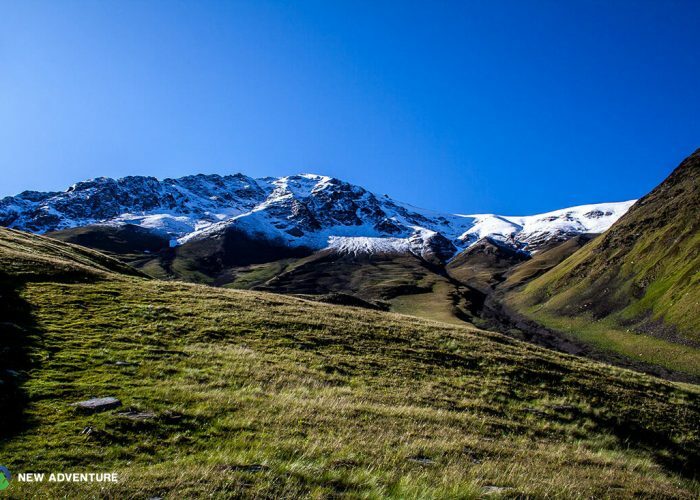 After several hours of hiking, we arrive at Atsunta pass, located at the height of 3431 meters above sea level and enjoy breathtaking views of high mountains. 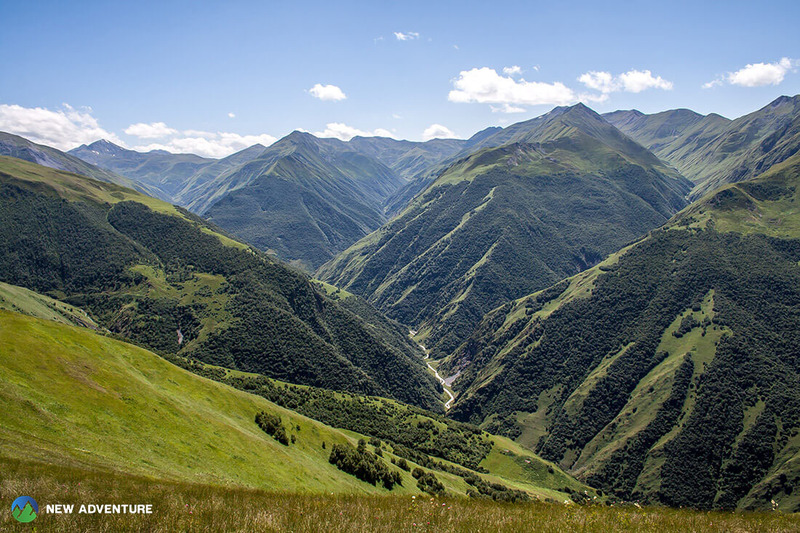 Here we leave Tusheti and continue our trip over the pass to Khevsureti region, nature of which is very diverse and not less impressive as of Tusheti. 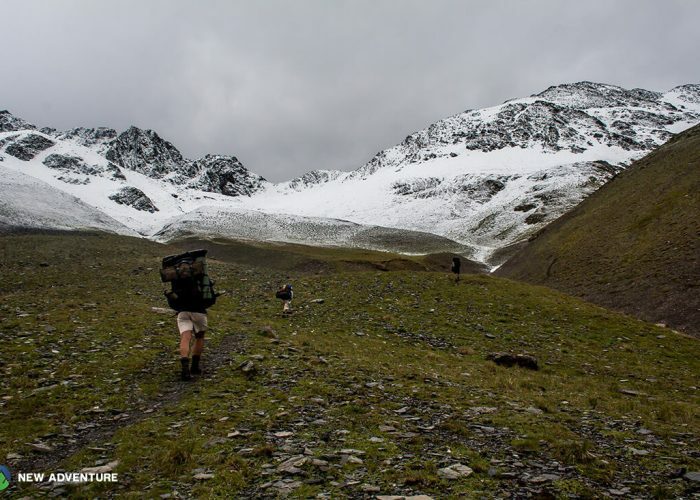 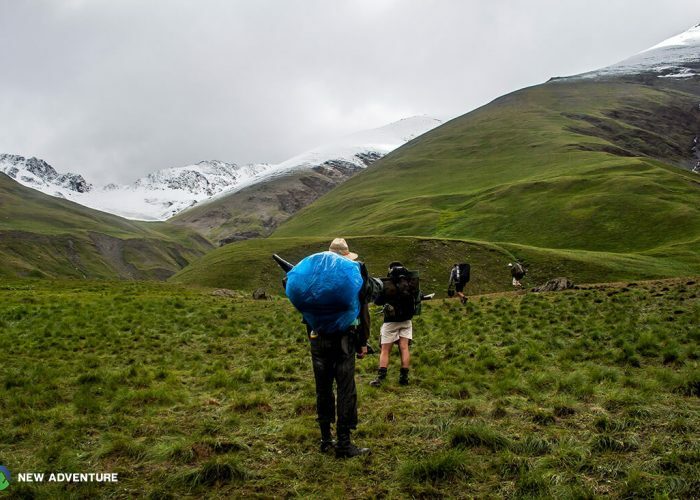 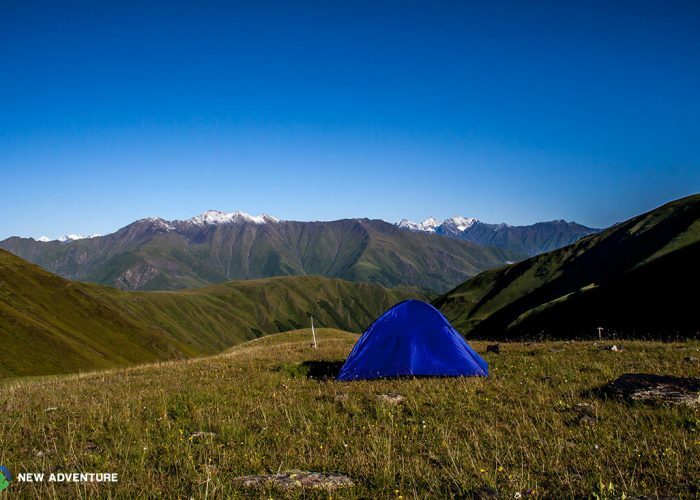 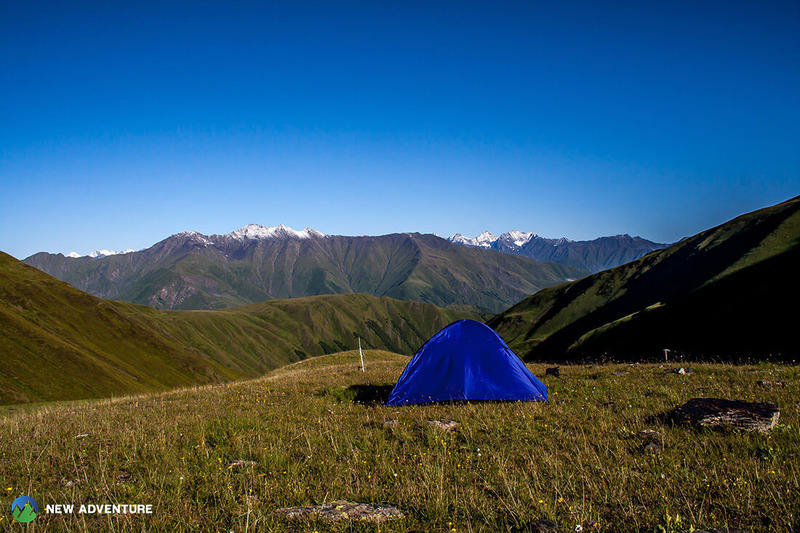 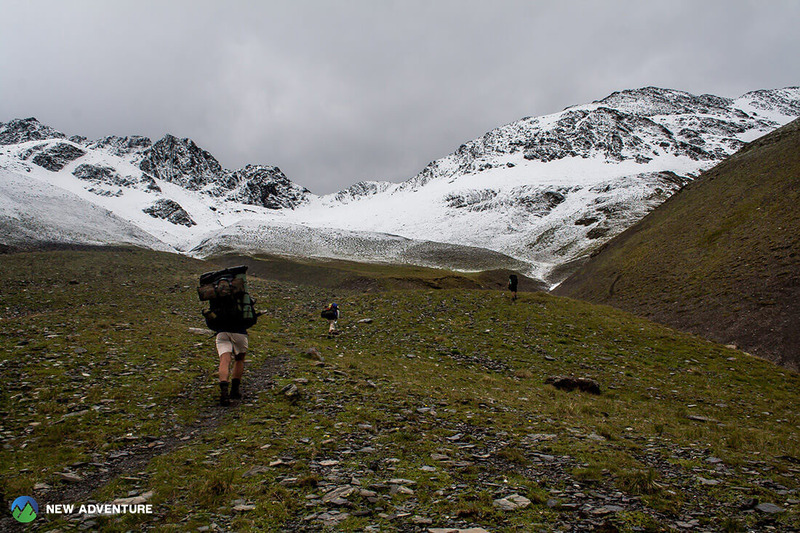 We hike down at the height of approximately 2700 meters and set up a camp at the meadow surrounded by snowy mountains. 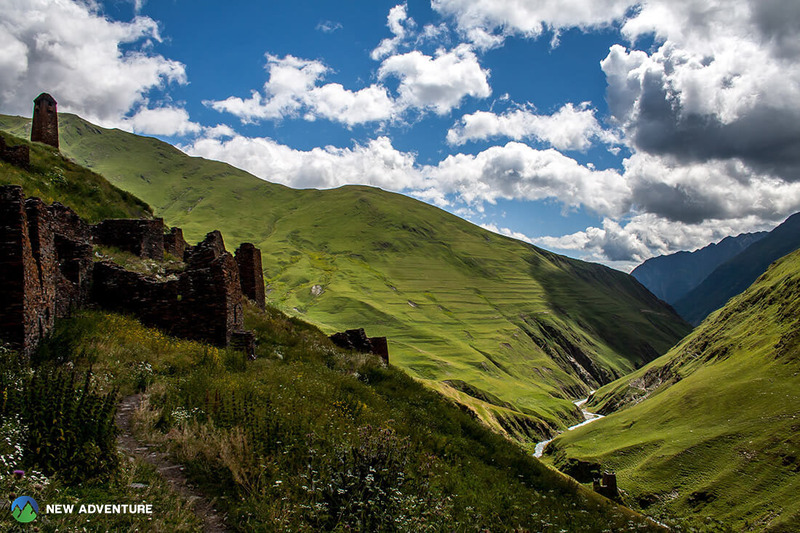 Early in the morning, we start hiking towards Shatili medieval fortress village. 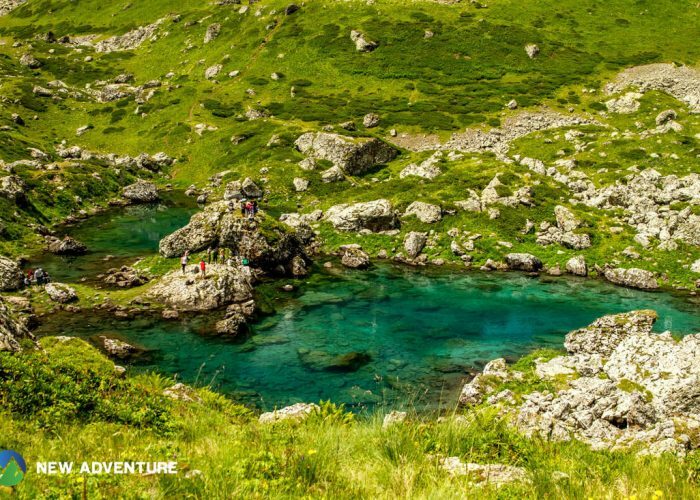 We hike down from the meadow to the gorge of a narrow river, pass village Ardoti and visit fortress village Mutso and tombs of Anatori, famous with the cemetery of deceased while plague. 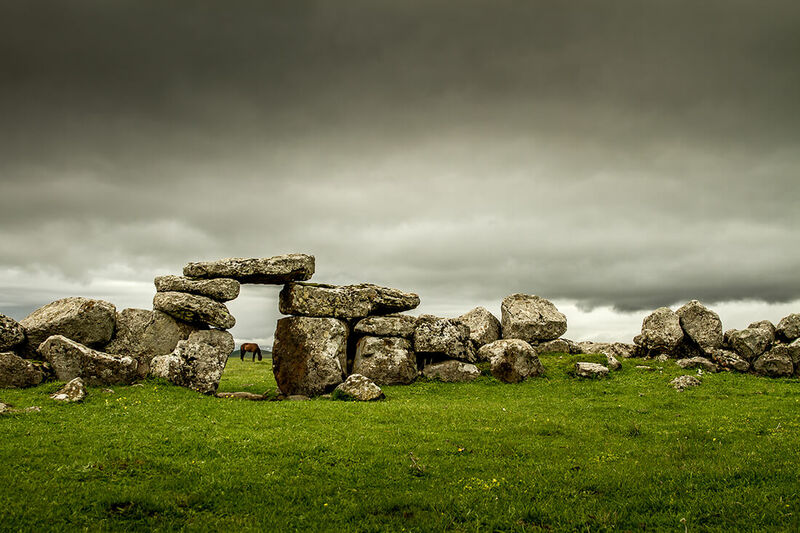 According to the saying, when a plague came to the town in the Middle Ages, those afflicted by the disease walked to the tombs, where they set and patiently waited to die, rather than infect their families and friends. 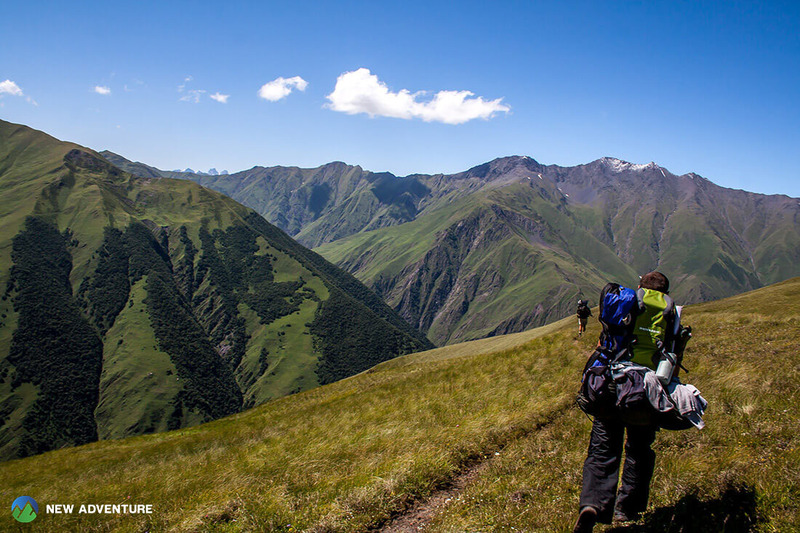 After exploring villages of Mutso and Ardoti, we continue hiking to Shatili. 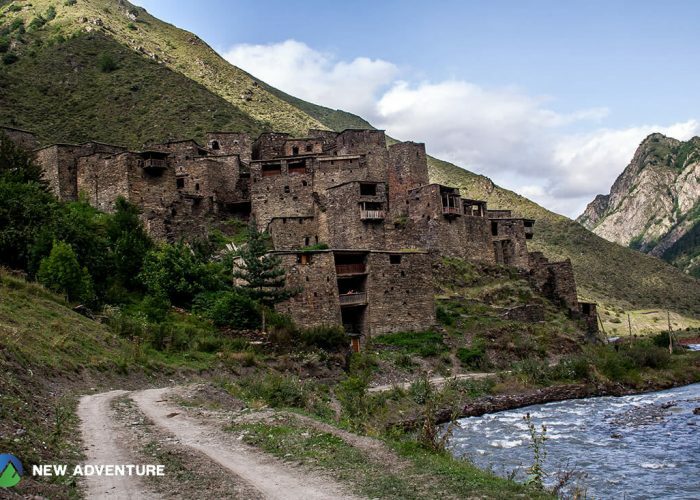 We start the day with visiting fortress Shatili. 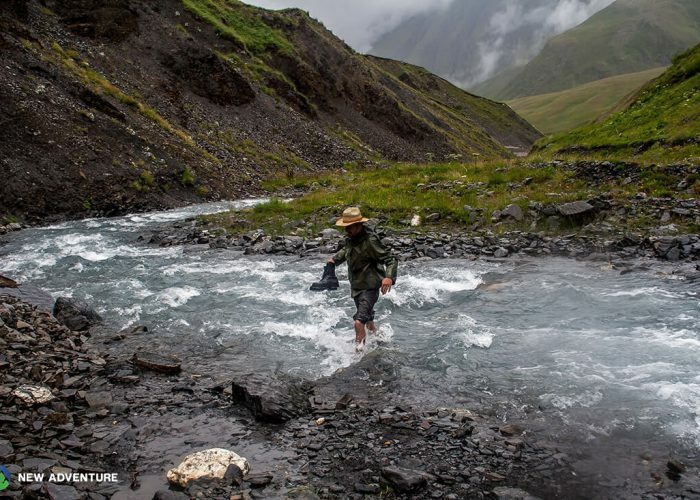 Afterwards, we continue driving with off-road cars towards the village Roshka. 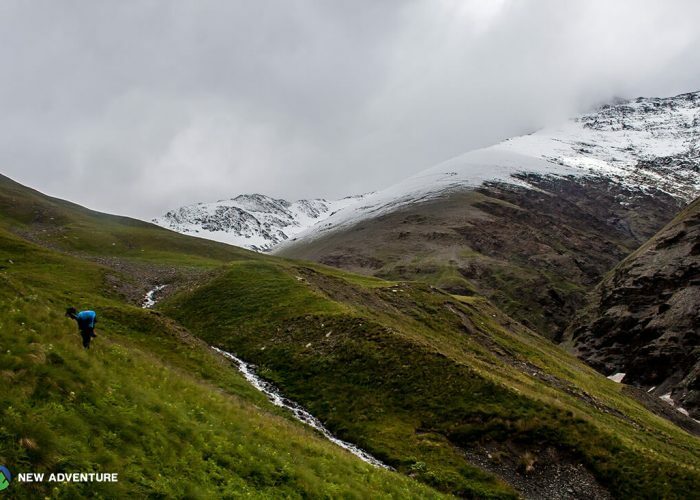 On our way, we visit Kistani and Lebaiskari villages, cross beautiful pass of Datvijvari (2600 m) and reach village Roshka. 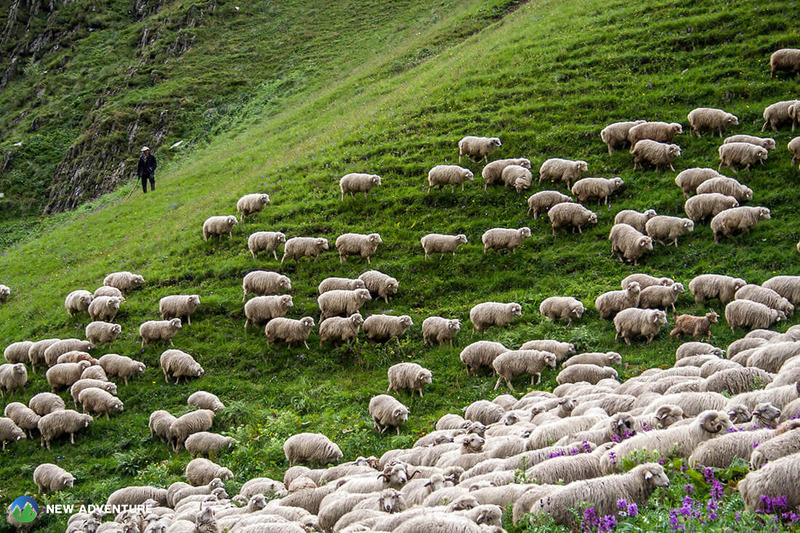 In the evening, we have a lazy walk around the village and free time to relax. 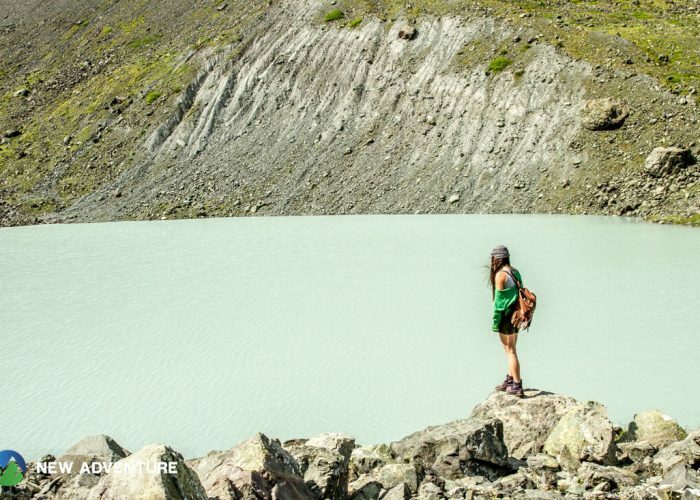 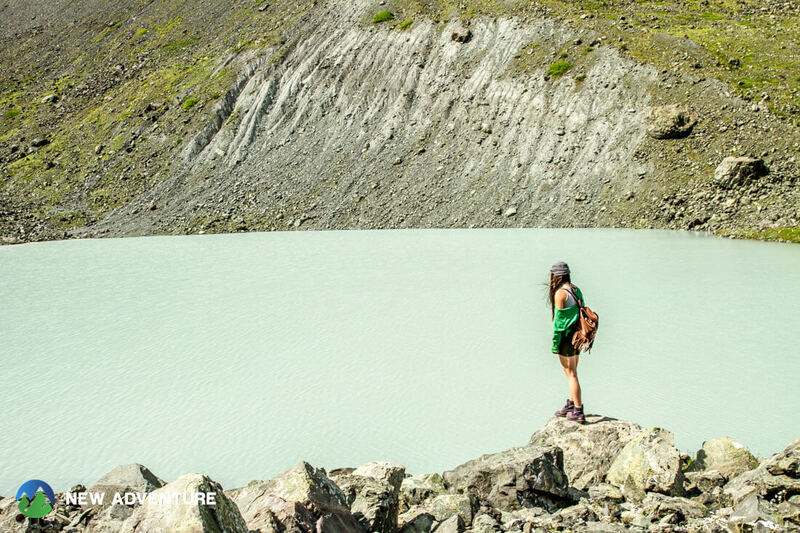 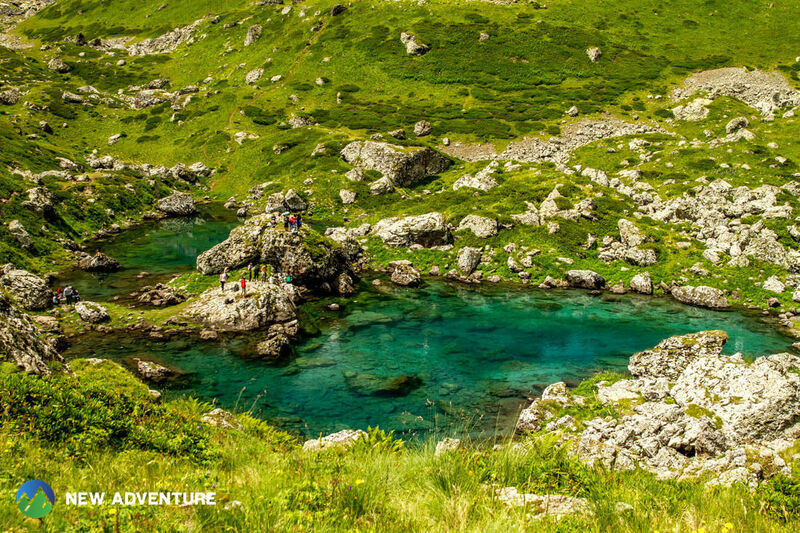 We start hiking from Roshka towards beautiful Abudelauri lakes: Green, Blue and White lakes. 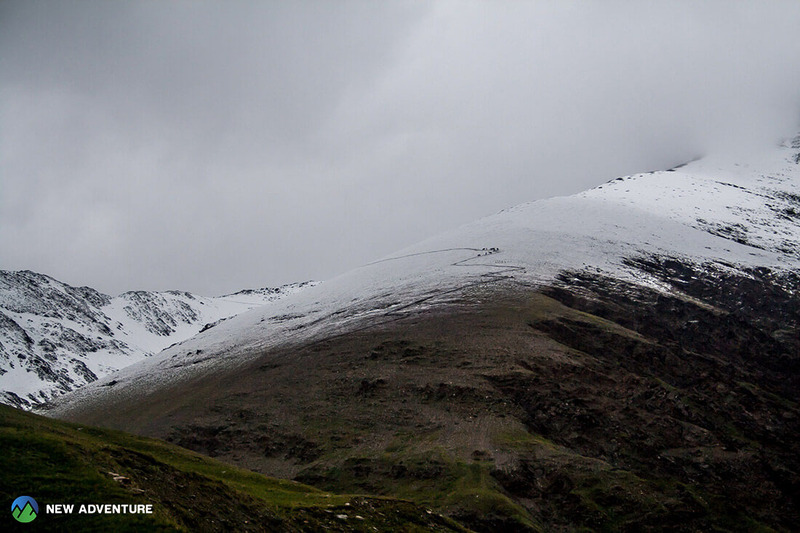 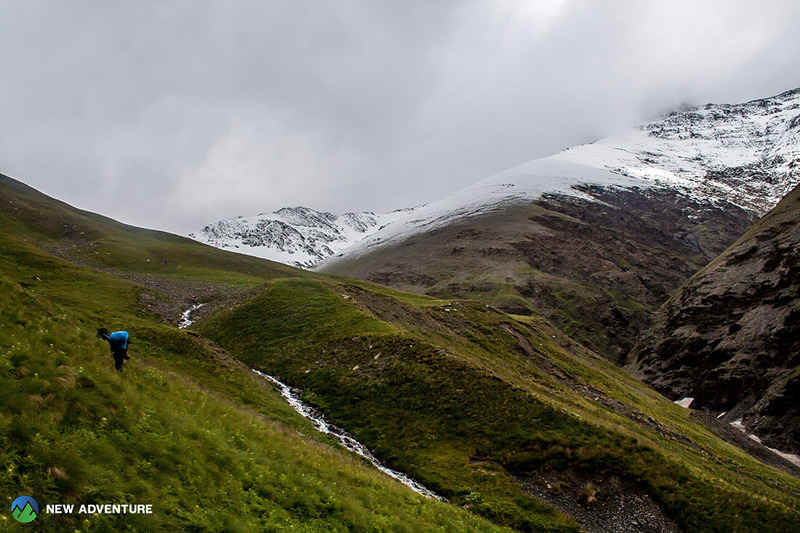 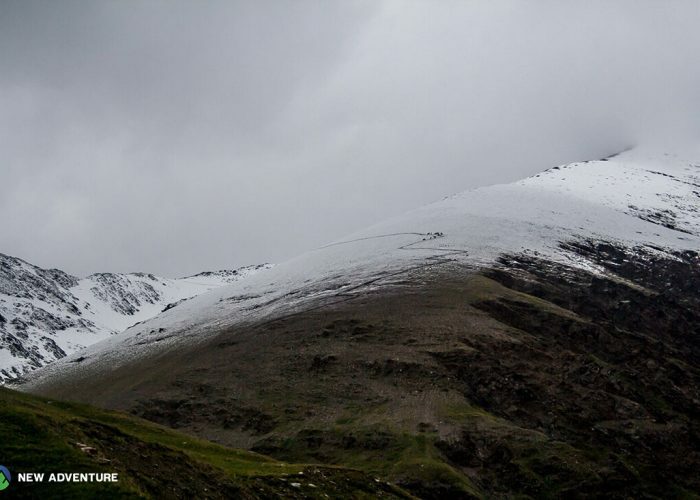 After a while, we get close to Chaukhi mountains, where Green and Blue lakes are located at the height of approximately 2600 meters above sea level, and in approximately half an hour of hiking, we reach White lake formed from a snow and ice and located at the height of 2850 meters above sea level. 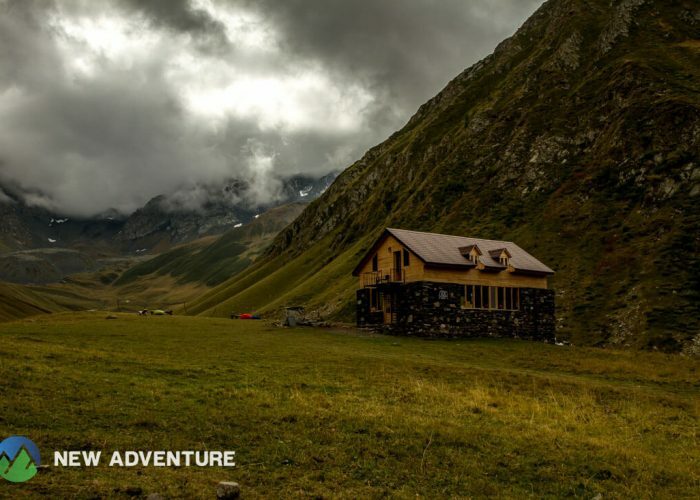 After a short break, we get back to village Roshka. 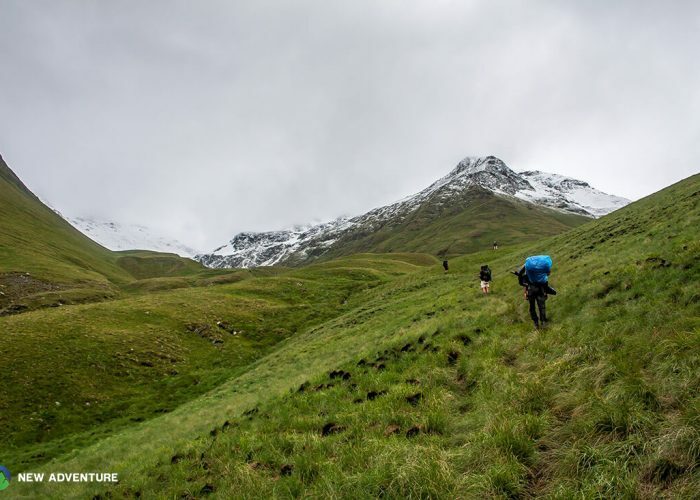 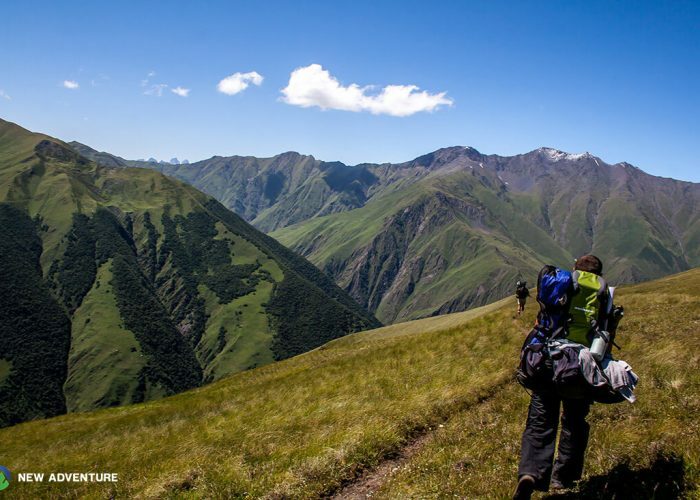 Today we take a route towards the pass of Sadzele (3056 m) with panoramic views over the mountains. 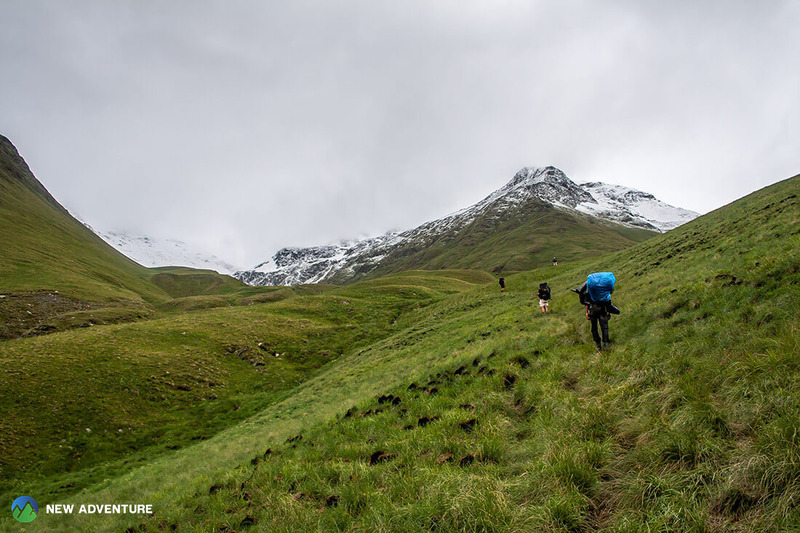 After a short break, we continue our journey towards the village Juta. 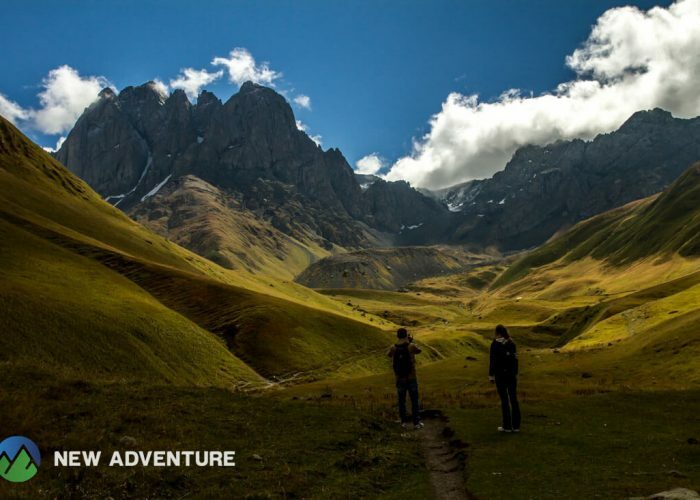 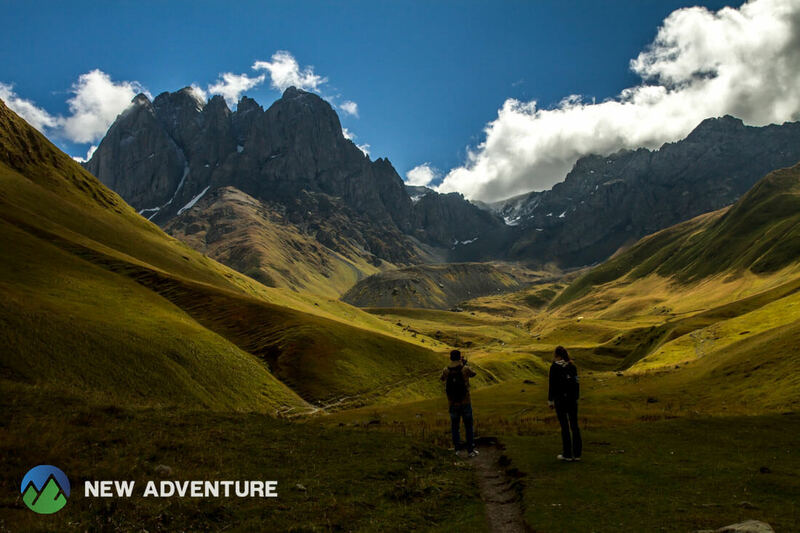 The tenth day of our journey starts with approximately three hours of hiking to the direction of Chaukhi pass After a short break we hike back to Juta and continue journey with off-road cars towards Stepantsminda. We cross beautiful gorge of Sno and visit Gergeti Trinity Monastery of the 14th century, located at the height of 2200 meters above sea level. 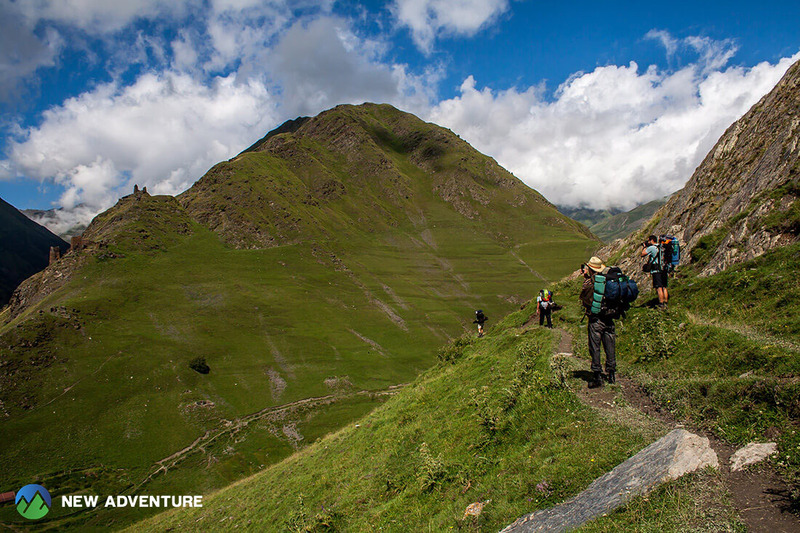 If wanted, we may walk the upward slope, which takes approximately two hours. 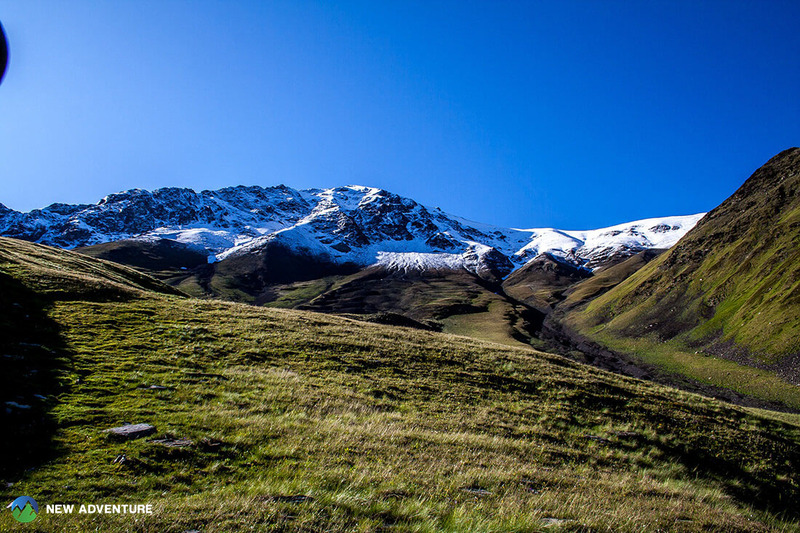 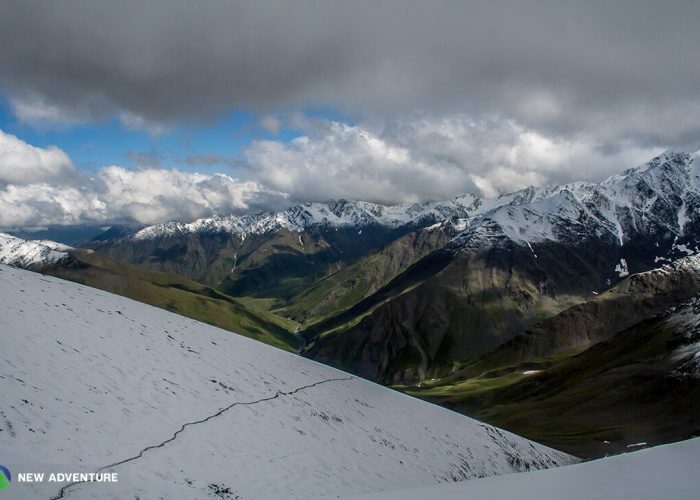 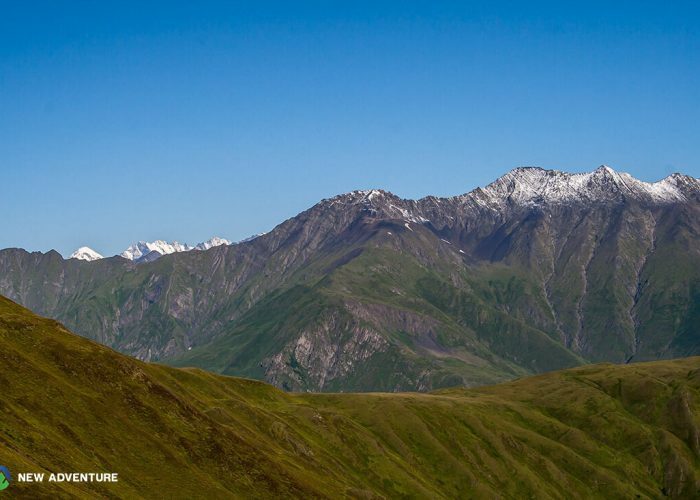 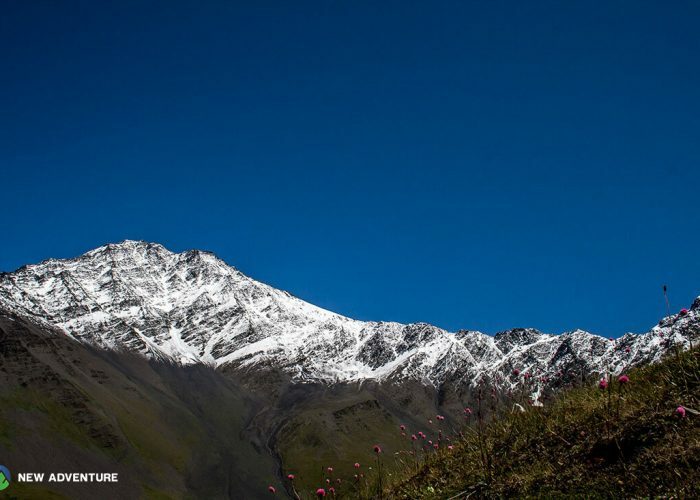 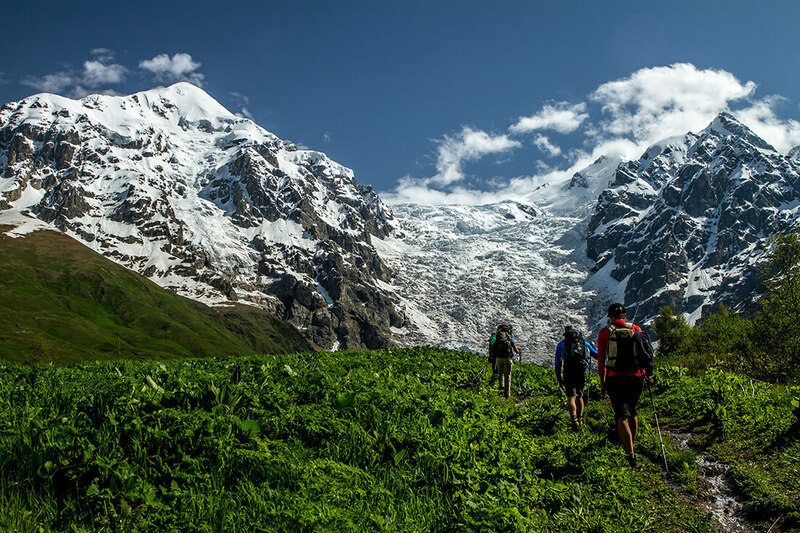 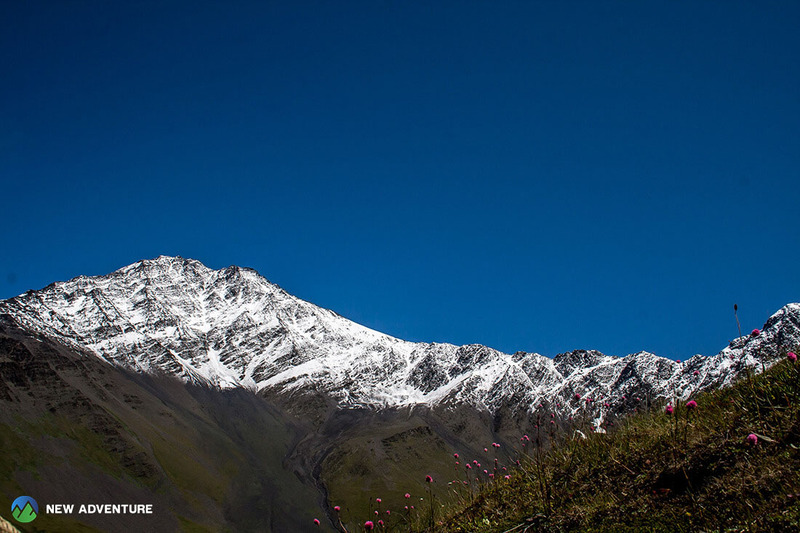 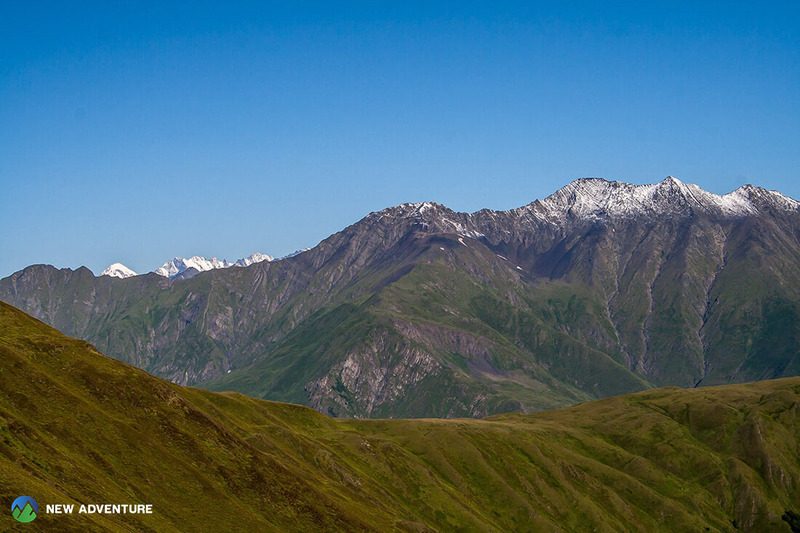 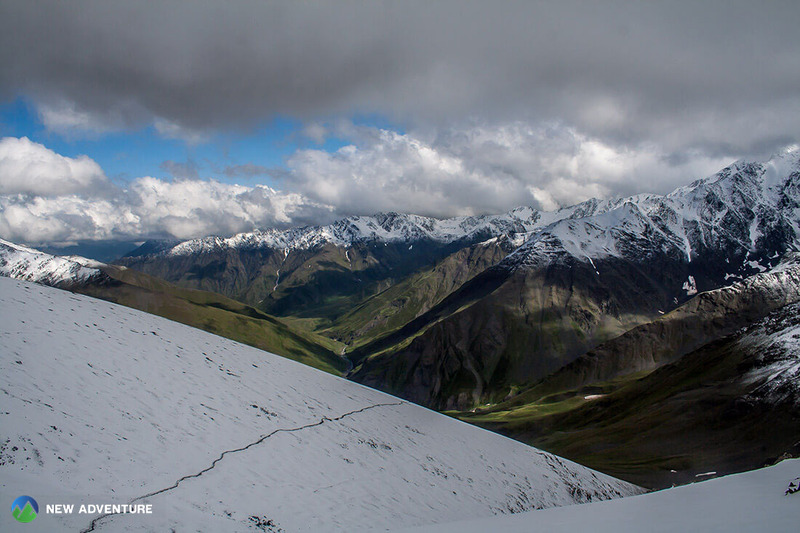 We can see one of the highest peaks of Caucasus – Kazbegi (Mkinvartsveri, 5047 m) and enjoy breathtaking views of mountains. 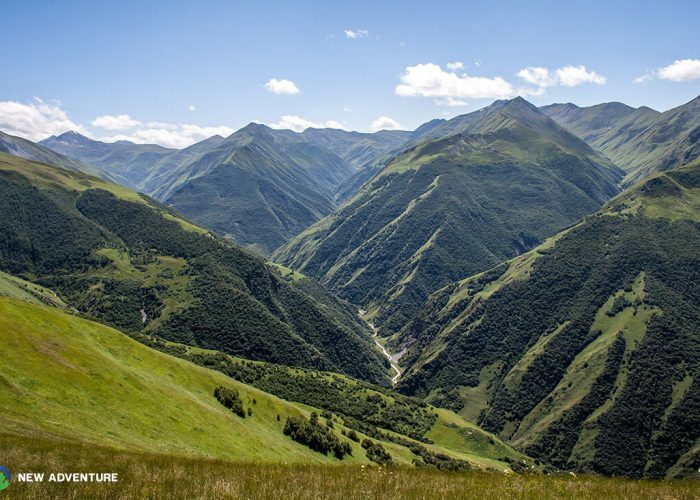 On the last morning of our trip, we drive towards the beautiful gorge of Truso. 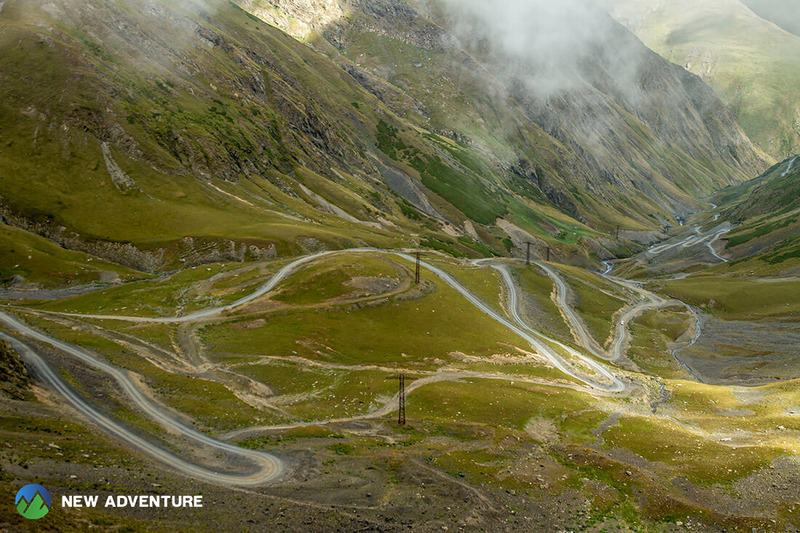 After visiting travertines and Nunnery in the village of Abano, we take a route to Tbilisi. 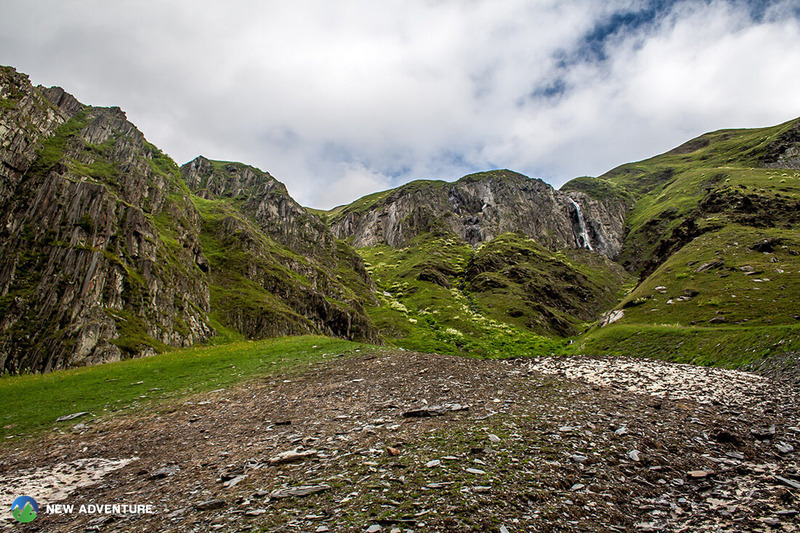 On our way, we cross famous Georgian Military Road, Jvari Pass and Gudauri ski resort. 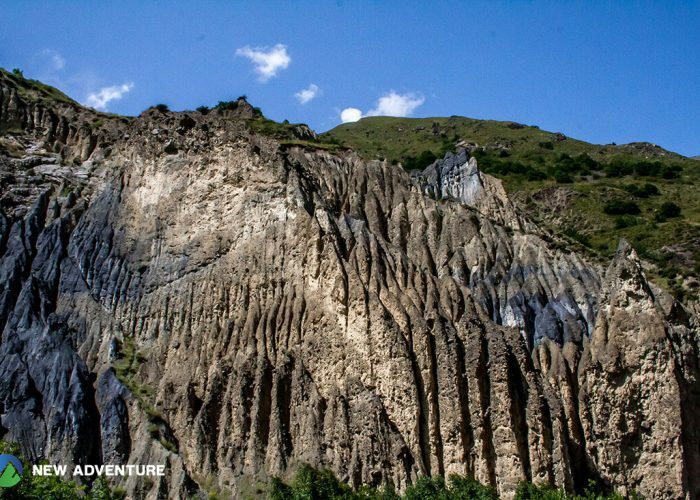 We stop at Russia–Georgia Friendship Monument to enjoy breathtaking views and afterwards, we visit Ananuri Church and Fortress of the 16th century.